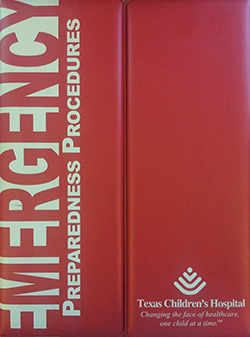 Emergency Management still needs your help updating Emergency Preparedness Procedure binders commonly known as “Red Books.” The binders are located throughout Main and West Campuses in clinical locations, on patient care floors and in common areas. The Emergency Management Team in partnership with leaders across the organization have updated close to 300 Emergency Preparedness Procedure binders but more work needs to be done. There still are binders that need to be updated with the latest Emergency Preparedness information so we are asking for your help once again. To simplify this task, the Emergency Management Team has developed a process that allows employees to update the binders themselves. The first step in that process is to locate all binders in your area and check to see if it has a sticker that says updated on the back lower left corner. If it does, you don’t need to do anything else. If your binder doesn’t have an updated sticker on the back, contact Elisha Colvin at egcolvin@texaschildrens.org to get an update kit mailed to you via interoffice mail. The kit will include replacement cards, an updated sticker and instructions on how to remove the old cards and position the new cards and where to place the updated sticker. If you have any questions, please contact the Emergency Management Team for assistance at EmergencyManagementTeam@TexasChildrens.org.